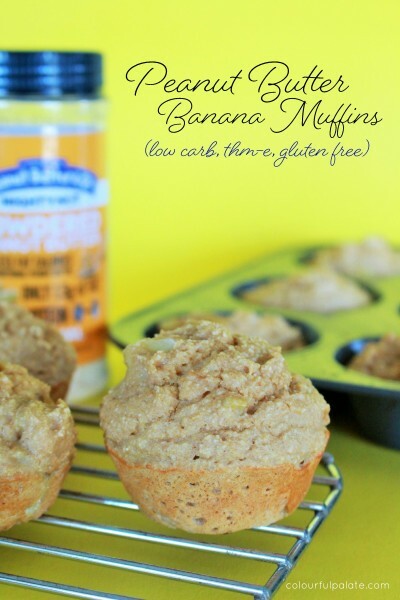 Peanut Butter Banana Muffins (+ Giveaway) was posted on October 26th, 2015 and is filed under Breads & Muffins, Gluten Free, Kid Friendly, Low Carb, Protein, Recipes, Snacks. This entry has 9 comments. You can follow any responses through the RSS 2.0 Comment Feed. 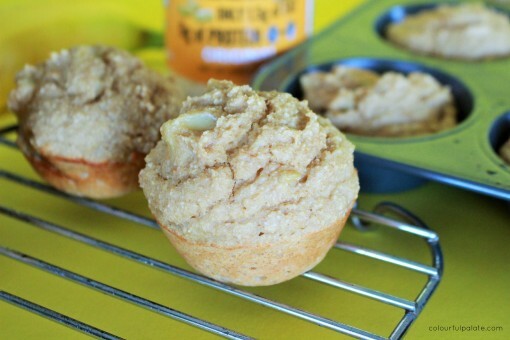 These muffins are truly a taste of peanut butter heaven. The problem with peanut butter is when, combined with a lot of carbs, it can cause weight gain. Quick lesson: A lot of carbs + a lot of fat = weight gain. Your typical peanut butter on toast might be a healthy snack for kids or for you on a high cardio day, but it really doesn’t do favours for the waist line. I eat a low sugar lifestyle (typically, I FOR SURE have treats, which are, exactly that…treats! ), which is lower in carbs and higher in fat…but do I forsake carbs altogether? Never. I’d cry a thousand tears. However, I do balance my carbs with protein and low-fat pairings. Like these muffins! Each one of these muffins is 7grams of protein, 1.5 grams of fat, and only 96 calories! So how do you get all that peanut buttery goodness without the added fat? 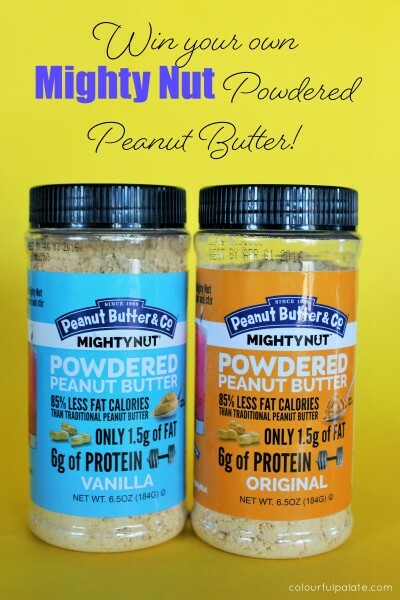 Enter the Peanut Butter + Co Mighty Nut powdered peanut butter! This stuff is fantastic. If I want toast, I can now smear my bread with gobs of creamy peanut butter without really any added fat, BUT with added protein (which allows less of a spike on blood sugar from the bread!). My world just got a little bit better. At the end of this post, you have an opportunity to win some powdered peanut butter of your own, with 85% less calories than the regular version! Yay! 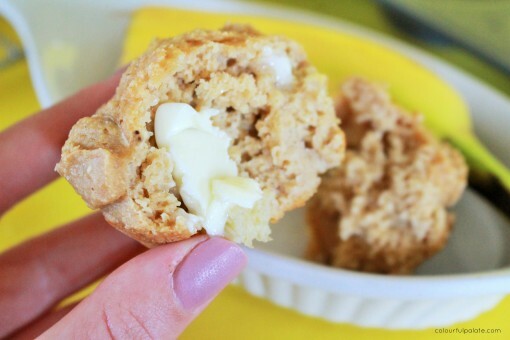 These fall muffins are delicious, a reminiscent of an after school snack with a little smear of butter (just allow yourself a teaspoon or less, you want to keep your fat under 6grams if weight loss/maintenance is your goal!). I already have “warm, fuzzy feelings”. They’re so good. Makes 12 muffins. *Or another low carb baking sweetener. I enjoy using Gentle Sweet from this store too! Directions: Preheat oven to 350 degrees. Coat muffin tin with cooking spray) muffin tin well. Combine all ingredients, except bananas. Fold in bananas gently last and fill the muffin tin. Bake 17-20 minutes. Giveaway restrictions: US only. One prize per person. If you win this giveaway, and have already won another prize from Mighty Nut through another blog, please disclose that you have already won so we can choose another winner. Giveaway ends on the 16th of November. UPDATE: Miranda is the winner! Congrats girl! This post is sponsored by Mighty Nut. As always, all thoughts, opinions, and reviews are my own. Would love a chance to try this, I’ve only tried other brands that aren’t perfectly on THM plan. Miranda, there is a tiny bit of sugar cane in this, however the grams of sugar are very low…especially in this recipe…and they do come from a whole food source. I’d try your pb muffins. Sounds like a good recipe. I have gluten free oat flour…do you know the weight of your oats, so I could use the flour instead of the oats? Ilene, I don’t know the exact weight but I’ve made it with flour too, about 1-3/4 cup. I use powdered peanut butter in everything, but I’ve never tried Mighty Nut! This sounds awesome for baking. Thanks for those. I suspect the powdered peanut butter would be good in smoothies. Ahhh! These look so good! I want try them ASAP. Previously I’ve used powdered peanut butter with my oatmeal, but I’d love to try baking it in cookies for the holidays!